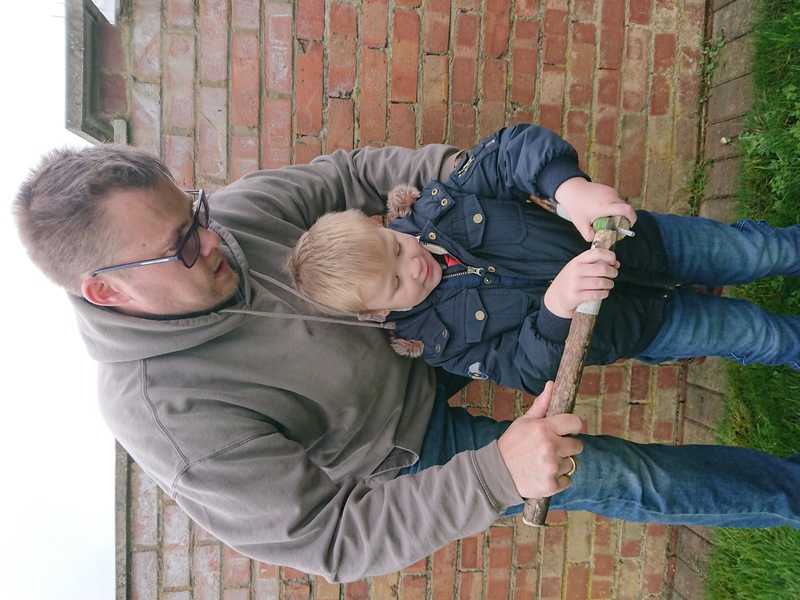 One of the biggest problems I’ve noticed teaching young people Fire lighting skills is the ability for the younger aged children to use a Fire steel. They just don’t have the “umph/power” to strike the rod on the fire steel to create sparks. I’ve tried all manor of ideas too try and get them to create sparks but all have failed. Without invading their body space and get up close and holding their hands and assisting them I’ve found no other way to help them learn how to physically hold the fire steel and create decent sparks. Young person struggling to hold a fire steel. 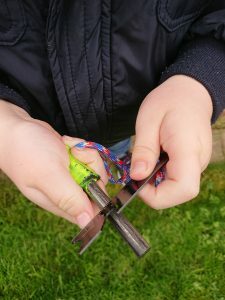 After sitting around the campfire with my fellow Bushscout leaders and discussing the many frustrations of being a Scout leader, we chatted about teaching Young Children how to properly use a Fire Steel. A few camps went past and still no ideas too solve my issue. 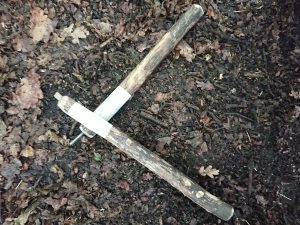 Then suddenly my good friend an fellow Scout leader Terry pulled out of his bag of tricks and wooden sticks, on the end of these sticks was a fire steel and striker. Terry explained that he had a brain wave and had a play in his garage and are up with this design. A few days later I created my own Fire Steel sticks in my shed. Getting Grace to test them out and a few minor alterations my Fire Steel Sticks was created. It’s a very simple tool to create. I found 2 sticks in the park where as Terry made his out a some scrap pine that was knocking around in his Garage. At 1 of the end I cut down a little section off the stick and screwed the rood onto the stick, the other stick I made a small slit in the stick and inserted the striker and then used some epoxy glue to finally secure it in. 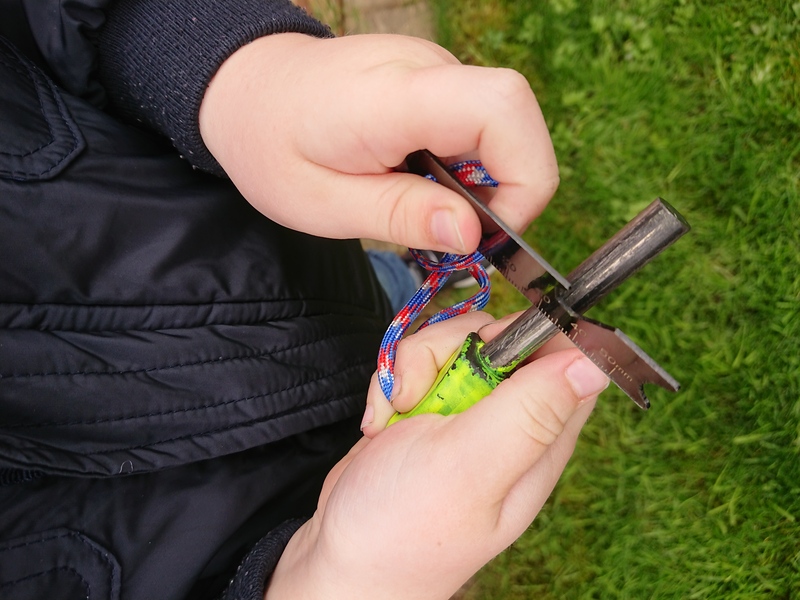 Attaching some tape around the sticks close to the rod and striker, this acts as a landmark for the young person to place their hands. The adult then comes to the side of the person and leans across the front of the person and holds then sticks and then shows the young person how to strike the fire steel. The young person then learns the movement of how to strike the fire steel, they also get a feel of how much pressure to apply. It’s a great simple tool to build to help to teach the young children. Furthermore to this, after a recent District training camp, a disabled Scout came to my Fire Lighting skills base and told me his difficulties of using a Fire Steel due to the small handle of the striker and he doesn’t have much dexterity in 11 of his hands. So I passed my Fire steel sticks to him and kept him have a go but without my assistance. The beauty of the Fire steel sticks is the handle are long. He explained to me how much easier it was to se a fire steel using my new Tool. 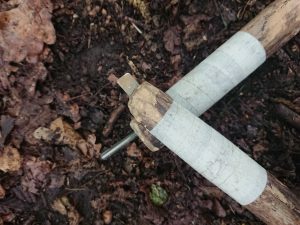 He now has made his own Fire steel sticks and uses it as him own method of lighting a fire. 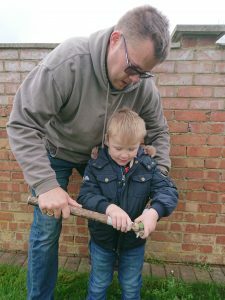 So if you teach young children Fire lighting skills, make your own Fire Steel sticks. I guarantee this will make it easier for your young children. There’s an instant warm buzz inside your body when you make Fire! I guess it’s a in built cave man feeling, It’s even better feeling when you get a young child making their 1st ever fire and see that smile that goes from ear to ear. That’s one of the main reasons why I love being a Scout Leader, knowing I’ve taught them a Skill for life. Great concept. Sharing this around!